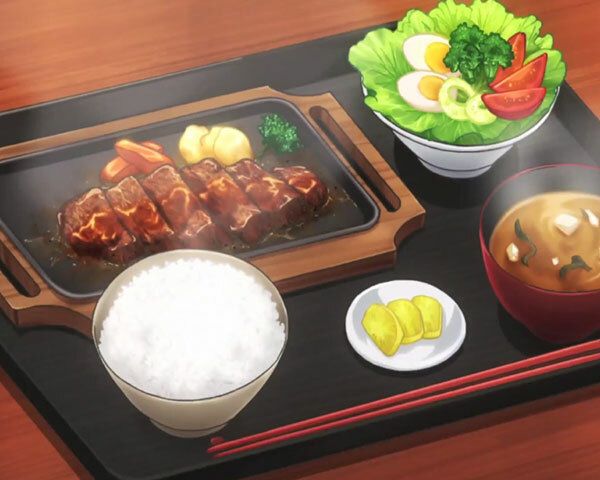 Food is a big deal in anime, because it’s a big deal in Japan. This is a nation that takes its food seriously and has some of the most delicious and interesting dishes in the world. So you’ll often see characters who love certain types of food, or mealtimes as common settings for dialogue to happen. Being able to cook well is often a positive character trait too. Of course, if Western audiences don’t understand what any of the food actually is, that can make things a little awkward! 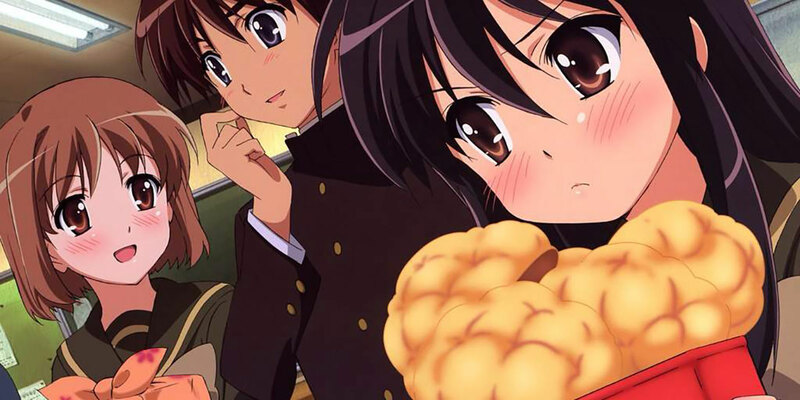 Since anime are made for Japanese audiences, the assumption is that the viewer will know the food in question. After all, they eat stuff like this on a daily basis. Some localizers have been so concerned about the “foreign” food in anime that they’ll replace them! A big rice ball might be swapped out for a good old American cheeseburger, with dialogue adapted to suit. 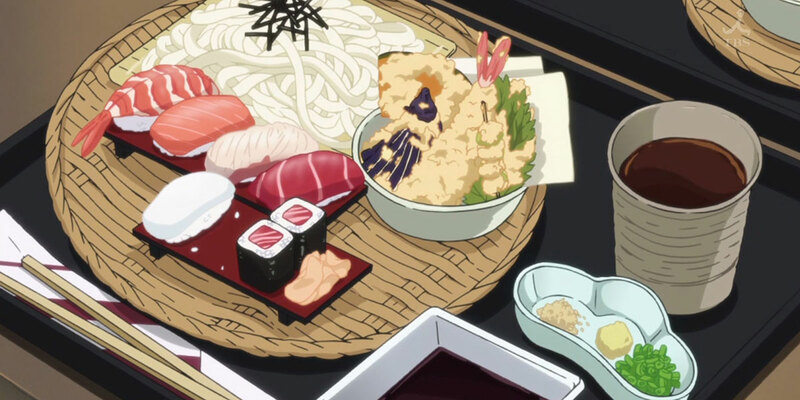 That’s not something that happens much anymore these days, so it’s a good idea to have at least a basic understand of common Japanese foods as they appear in anime. “Melon” is, well, melon. “Pan” is the Japanese word for bread. So the direct translation of the name is “melon bread”. You’d think the name has something with its flavor, but actually the name comes from melonpan’s appearance. The outside is covered in a layer of crisp cookie dough, which looks like the skin of a green melon. The round shape of the bread only adds to this impression, so it sort of makes sense. The inner dough of this bread is sweet and comes in various flavors. While the name has nothing to do with melon flavoring, these days you can in fact get melonpan with melon in it. It’s all very meta. Miso is one of the most fundamental seasonings in Japanese food. They make it by fermenting soybean, salt, and a specific fungus. The most common variant of miso is quite salty, but there are various variants. It can also include various wheats as well. Miso is, of course, the key component in miso soup and broth. It forms the basis of many noodle dishes such as miso ramen. It’s also freaking delicious if you love salty things. 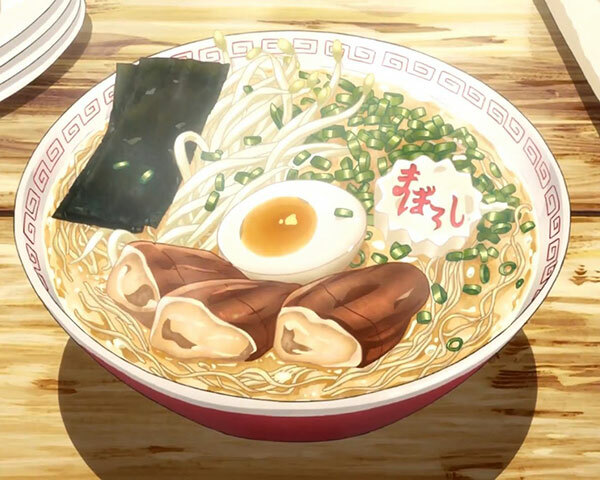 This is possibly one of the most recognizable Japanese foods in anime, manga, and video games. Onigiri are known as “rice balls” in English, but are generally not round. Instead they look triangular or cylindrical. Inside the rice ball there is a salty or sour filling, such as salted salmon. This comes from the days before refrigeration – the filling helps preserve the Onigiri. Most of the time the Onigiri is also wrapped in a strip of seaweed, or “nori”. Onigiri are very popular in Japan and you can pretty much buy them anywhere. If you ever get the chance to eat one made by a competent chef, it’s well worth it. Ramen is another dish you’ll hear about time and time again. It’s famously the favorite dish of Uzumaki Naruto, star of the eponymous manga and TV show. Ramen comes in a massive number of varieties, but at its most basic it consists of Chinese-style wheat noodles in a broth. Miso ramen has been popular since the mid-60s, but there are also other meat and vegetable broths that can be used for a more traditional take. The great thing about ramen, other than the noodles soaked in a tasty broth, is the inclusion of a variety of ingredients. Cuts of pork or beef, boiled eggs, nori, various vegetables, calamari, and more can find their way into your ramen bowl. Basically, there’s some form of ramen most people will like. Also, it’s good manners to slurp when you eat it! In Japanese, the word “sake” just means “liquor”. Any alcoholic drink is “sake”, but in the West (just as with “anime”) the word has come to represent a very specific type of Japanese liquor. What we call “sake” is a type of alcohol made by fermenting rice. The Japanese refer to it as “nihonshu”, although the label might also refer to it as “seishu”. Sake is consumed hot or cold and is quite a bit stronger than beer or wine, but the bottled stuff is usually watered down a little bit to make it more palatable. It’s the national drink of Japan and has a special ceremonial role in various occasions. This is probably the one Westerners know the best. Sushi has become an international phenomenon. Sushi eateries are available just about everywhere you go. There are many types of sushi, but to qualify as sushi you must use vinegared sushi rice. Toppings and fillings can be anything, really. However, raw salmon, tuna, and various vegetables are traditional. Sushi comes in various styles. Many of those we know in the West aren’t Japanese. Those such as the California roll were not invented in Japan. There are now plenty of sushi variants that have evolved completely outside of Japan. Some of these ideas make it back to Japanese shores and start a whole new process of innovation. One could write an entire book about sushi, and plenty of people have. But there is one common misconception about the fish used in the dish. While it is true that raw, uncooked fish is used in sushi, that does not mean the meat is unprepared. Modern sushi is actually frozen in special freezers. The meat might be frozen for as much as two years in some cases! Yet typically it’s usually between 15 hours and 7 days, depending on the freezer temperature. Why? Well, since you can’t cook the fish, the only way to get rid of parasites such as nematode worms is to freeze the meat. Some types of tuna, farmed fish, and shellfish are exempt from this need because the chance of parasites is pretty low. The bottom line is that good sushi is one of the most delicious things in the world. It’s also a pretty pricey type of food, so often you’ll see broke characters lust after it. Soba is a type of noodle made from buckwheat. Udon noodles are also made from wheat, but are much thicker. In the West we can often get Udon noodles from Asian restaurants, but soba seems to be more scarce. Soba is used in many dishes, but one of the most interesting things about this particular noodle type is how it’s also eaten cold. Chilled soba dishes also have a unique eating style; you’re provided with a dipping sauce and you dip the soba with your chopsticks before eating it. Cold dishes usually just offer plain noodles and the sauce. Hot soba dishes, on the other hand, are much like ramen – served in a hot broth with various toppings. Taiyaki is one of the most unique foods I’ve seen in an anime, and more than a few characters in various shows seem to have a special love for this food. Taiyaki is a baked snack molded in the shape of a fish. The fish in particular is a sea bream. It started out as a festival food and has become a mainstay since. The outside of taiyaki is basically the same batter you’d use to make pancakes or waffles. The traditional filling is a type of sweet red bean paste. However, you can also get them with fillings such as chocolate or custard. Sounds pretty yummy, right? The Americans have a reputation for frying absolutely everything, even chocolates. Heck, they even refry some things, since they aren’t fried enough. That doesn’t mean that other cultures haven’t figured out the flavor potential of frying food in oil. Like the word “pan”, “tempura” is a Portuguese import. When they brought deep fried seafood and vegetables to 16th-century Japan it soon became incredibly popular. Today the Japanese have mastered the art of making tempura and you can get just about any creature from the ocean anyone is willing to eat. Common examples include prawn, crab, and squid. On the vegetable side they’ve also gone pretty crazy. Mushrooms, peppers, eggplant, and many more vegetarian options are just as delicious as the meats. Yakiniku just means “grilled meat”. The word “niku” means meat and in this case that meat comes on a stick. What’s special about meat on a stick? There’s meat on a stick in every culture that has both meat and sticks. Yakiniku is a relatively modern food development that looks a lot like Korean BBQ, but developed independently after the second World War. Yakiniku is bite-sized and grilled on charcoal or, these days, even electric grills. You can get them with offal, pork, beef, chicken, various seafood, and some additional veggies such as shiitake mushrooms. It’s pretty good for food on a stick, especially with some teriyaki sauce. At first glance yakitori, or “grilled bird”, might seem like just another type of yakiniku. However, yakitori is very different from chicken yakiniku. They are not meant to be bite-sized with thin strips of meat, but are bigger and heavier foods. Yakitori is a very popular street food and there are dedicated stalls on routes with lots of foot traffic.